College athletes have gotten in trouble for many, many things, but this may be a first. Several Oregon football players are facing disciplinary action after a snowball fight turned dangerous last week. 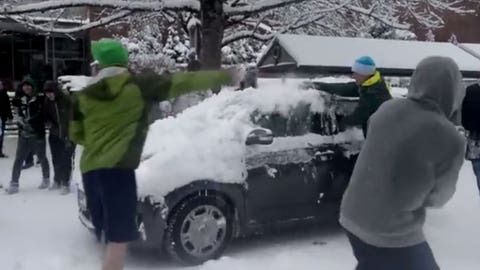 Of course, everyone knows about the snowball fight because there was video, which became a big hit on the web, generating more than 2 million views on YouTube. The snowball fight, which had more than 100 participants, was reportedly organized by unidentified players on the football team. "On Saturday, I was made aware of an incident that occurred Friday afternoon during the snow day involving multiple Oregon students including members of the football team," Oregon football coach Mark Helfrich said in a statement. "The behavior exhibited in the video is completely unacceptable and dangerous. We take this matter very seriously and disciplinary actions have begun."